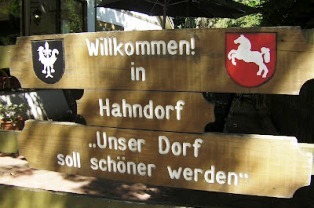 The town of Hahndorf is Australia’s oldest surviving German settlement. German immigrants known as Old Lutherans arrived there in 1839 to escape religious persecution in Prussia (Hahn was captain of the ship named Zebra they arrived on). They laid their settlement out in Hufendorf style, and were soon well known for their pious customs and zest for hard work – even though the lack of translators in Adelaide made them difficult for locals to understand. These days, Hahndorf is easily found after a thirty-minute drive along the South Eastern Freeway from Adelaide. Notable attractions include traditional fachwerk half-timbered architecture, and St Michael’s Lutheran Church begun in 1839, and still home to a worshipful congregation. From time to time the settlement was hit by schisms though. The breakaway St Paul’s Lutheran Church was established in 1846 when pastors Kavel and Fritsche experienced theological differences. During World War One, the South Australia Government changed Hahndorf’s name to Ambleside. This was corrected in the 1930’s (although the replacement name is still seen in various places). These days of course German migrants travelling to Australia have an easier time of it. They arrive on modern jet planes and have NAATI Translators to assist them with their documentation. They also no longer need to build half-timbered houses. In fact, Australian architecture is among the most modern in the world. . Thanks, Wikipedia for the photo and Incidental Nomads for the welcome sign.